Despite every effort using the best science available, cutting edge technology, as well as modelling and advice from highly skilled professionals who are the best in their field, unfortunately, the search has not been able to locate the aircraft. 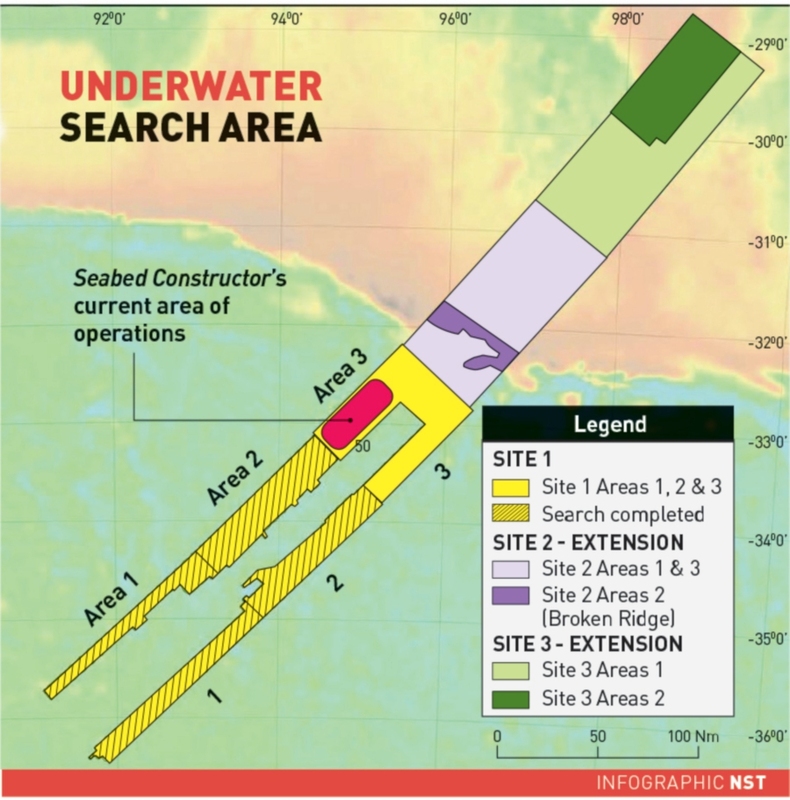 Accordingly, the underwater search for MH370 has been suspended. The decision to suspend the underwater search has not been taken lightly nor without sadness. It is consistent with decisions made by our three countries in the July 2016 Ministerial Tripartite meeting in Putrajaya Malaysia. Whilst combined scientific studies have continued to refine areas of probability, to date no new information has been discovered to determine the specific location of the aircraft. Families of passengers on board missing Malaysia Airlines flight MH370 have launched a campaign to privately fund a search for the aircraft. Flight MH370, carrying 239 people – more than half of whom were Chinese nationals – went missing on its way from Kuala Lumpur to Beijing, nearly three years ago, on March 8, 2014. Australia, Malaysia, and China jointly called off a two-year underwater search for the aircraft in January. Grace Nathan, a Malaysian lawyer whose mother, Anne Daisy, was on the plane, said the families hope to raise US$15 million to fund an initial search north of the previous search area. “We won’t start fundraising until we’re sure that the governments are not going to resume the search and until the current data has been fully reviewed and analysed,” she said at the campaign launch and MH370 memorial event at a mall in Kuala Lumpur. Malaysian Transport Minister Liow Tiong Lai, who attended the event, said authorities had analysed 27 pieces of potential MH370 debris along the East African coastline, including two new pieces found in South Africa two weeks ago. The government has also signed several agreements with countries along the East African coastline to coordinate searches for debris, Liow said. CANBERRA, Australia -- The Australian government minister in charge of the suspended seabed search for a Malaysia Airlines jet told victims’ families and friends at an anniversary church service Wednesday he remained hopeful that Flight 370 would be found. “While to date we have been unsuccessful, we remain hopeful that at some stage in the future, there will be a breakthrough, the aircraft will be found, and we will be able to answer more of your questions,” said Darren Chester, minister for infrastructure and transport. Chester and Angus Houston, the former Australian defense chief who coordinated the early months of the search efforts, were among around 100 who attended the private ceremony at St. John’s Anglican Cathedral in the east city of Brisbane to mark the third anniversary of the mysterious tragedy. A new analysis of satellite photos taken two weeks after Flight MH370 mysteriously vanished may help scientists narrow the search area for the missing Malaysian Airlines aircraft to three regions in the southern Indian Ocean. A recent report indicates that finality may never come for the families of the missing. Since halting its search efforts in January, the Australian government has been compiling an exhaustive report on the effort. The final document, published Tuesday, was written by the Australian Transport Safety Bureau. It offers a blunt conclusion: “The reasons for the loss of MH370 cannot be established with certainty until the aircraft is found.” And that is unimaginable, the report said. But that appears to be what happened. As families lit white candles and remembered loved ones who vanished aboard Malaysia Airlines Flight 370, they were given new hope Saturday that the world's biggest aviation mystery might soon be solved. It's been four years since the plane, which was carrying 239, went missing over the Indian Ocean. A new search that stretches across thousands of miles of the sea could likely conclude in June. Malaysia’s civil aviation chief, Azharuddin Abdul Rahman, made the announcement at a remembrance event near Kuala Lumpur Saturday that marked the plane's disappearance. Malaysia and Ocean Infinity, a company based in Houston, Texas, came to a deal in January to start a new search for the plane. The company will only be paid if successful. IT’S 33 days and counting. And as the latest search for MH370 struggles to locate the missing aircraft, fears are again growing the missing aircraft will never be found. Ocean Infinity’s search with their 65-man vessel Seabed Constructor began their search amid much optimism, but exactly four years after the plane went down the latest search of the southern Indian Ocean has revealed nothing after 16,000sq km of the 25,000sq km area. It was previously identified by an Australian Oceanographer as the “likely” resting place of the aircraft. The New Straits Times reported those involved in the search are still optimistic about finding the plane but have encountered a number of unexpected problems thus far. The Royal Malaysia Navy has two officers Azmi Rosedee and Adbul Halim Ahmad Nordin on board the Seabed Constructor, who send daily updates back to Kuala Lumpur on the search’s progress. Those reports have revealed the struggles of the Norwegian search ship while enduring massive seas including 15m waves. A new scan of the Indian Ocean floor for Malaysia Airlines Flight 370 has searched nearly 80,000 square kilometers (31,000 square miles) since January without finding any sign of the wreckage. But the company looking for the plane, which has been missing for more than four years, said it is still determined to find it. This comes despite earlier hopes that a 25,000-square-kilometer (9,650-square-mile) area most likely to contain the missing aircraft had been identified. Ocean Infinity, the American technology company conducting the latest search, said in an update Monday that it had scanned up to 1,300 square kilometers (500 square miles) per day since launching its mission far off the west coast of Australia in late January. It has searched both inside and outside an area identified by Australian authorities. "Whilst it's disappointing there has been no sign of MH370 in the Australian Transport Safety Bureau search area and further north, there is still some search time remaining," Ocean Infinity chief executive officer Oliver Plunkett said in a statement. "Everyone at Ocean Infinity remains absolutely determined for the remainder of the search," he said. The company's Seabed Constructor research vessel is stopping in the West Australian port of Fremantle for resupply and crew rotation before returning to the search until it's forced to quit in the southern hemisphere's winter. Plunkett's statement indicated Ocean Infinity's search could be halted before mid-June due to weather conditions at sea. I wondered what amazing and interesting things might be discovered while searching for MH370. CANBERRA, Australia -- A four-year search of the depths of the Indian Ocean has failed to find Malaysia Airlines Flight 370. But the unprecedented sonar hunt for the missing airliner might be close to solving 19th century mysteries - the locations of two sailing ships that vanished with cargos of coal. Maritime historians on Thursday published a short list of the possible identities of two shipwrecks found during the initial 710,000-square kilometer (274,000-square mile) three-year search for the Boeing 777 that was lost in 2014 with 238 people aboard. The wrecks, found in 2015, are 36 kilometers (22 miles) apart and 2,300 kilometers (1,440 miles) southwest of Australia in debris fields scattered with coal more than 3.7 kilometers (2.3 miles) below the ocean's surface. Ocean Infinity, a U.S. technology company conducting a new search, said this week it had covered nearly 80,000 square kilometers (31,000 square miles) since January without finding any sign of the plane's wreckage. In January, the Malaysian government pledged to pay Ocean Infinity up to $70 million if it could find the wreckage or black boxes of the aircraft within 90 days. The government signed a "no cure, no fee" deal with the Houston, Texas-based company to resume the hunt for the plane, a year after the official search by Malaysia, Australia and China in the southern Indian Ocean was called off. An investigation by an Australian TV news program suggests the pilot of Malaysia Airlines Flight 370, which disappeared with 239 people aboard more than four years ago, deliberately crashed into the Indian Ocean. Investigators are still searching for the aircraft, but these findings raise the possibility that one of the greatest aviation mysteries in modern history may not have been a catastrophic accident, but instead a possible mass murder-suicide. "60 Minutes Australia" brought together an international group of aviation experts who say that the disappearance of MH370 was a criminal act by veteran pilot Captain Zaharie Ahmad Shah. "He was killing himself; unfortunately, he was killing everybody else on board, and he did it deliberately," said Canadian Air crash investigator Larry Vance. Though theories on exactly what happened to Malaysia Airlines Flight 370 will likely persist for years to come, the four-year search is coming to an end. The Malaysia minister of transport told reporters on Wednesday that the hunt for the passenger plane, which mysteriously disappeared on March 8, 2014 while carrying 239 people en route to Beijing from Kuala Lumpur, by a private U.S. company is ending next week. The latest search for MH370 — the Malaysia Airlines plane that disappeared four years ago en route from Kuala Lumpur to Beijing with 239 people onboard — has ended in failure, the company behind the search said on Tuesday. The company, Ocean Infinity of Houston, which scoured the seabed for any sign of wreckage with support from the Malaysian government, announced that the search was winding down with no evidence of the plane’s whereabouts. He did not rule out a future resumed hunt. Ocean Infinity said it was heading to one last spot of interest before it turns back for good. The Guardian has learned that the seafront exploration company’s Seabed Constructor vessel will sail to the spot in the southern Indian Ocean where a Chinese patrol ship detected an ultrasonic pulse – which could have been consistent with that from a black box – in 2014. However, it appears that in a last-ditch effort, the Seabed Constructor will continue for at least two more days to survey a spot 25 degrees south and 101 degrees east within the original 84,000-sq-mile search zone. Speaking on Wednesday, Loke said the search for the MH370 had cost 500m ringgit (£95m) and Ocean Infinity would be releasing a full report on their findings by July. THEY’VE lost out on the MH370 finder’s fee of more than $90 million, but underwater exploration company Ocean Infinity is showing no sign of giving up on the lost plane. Since the official search ended last Tuesday, Norwegian research vessel Seabed Constructor has continued the hunt on its own steam — now looking in previously uncharted areas. Two sources close to the search have told news.com.au that there is talk of Ocean Infinity resuming the search after the treacherous winter months were over. It is understood that the company will head to Dampier in Western Australia for a commercial job but may return to the southern Indian Ocean to search for the plane towards the end of this year or the beginning 2019. “I don’t think Ocean Infinity is done here,” one source told news.com.au. Despite not receiving a single cent in payment, the whole operation had been a “big PR win for them”, the source said. An Ocean Infinity spokesman confirmed to news.com.au the search would likely wrap up on Friday. KUALA LUMPUR (Reuters) - Malaysia will release on July 30 a long-awaited report into the disappearance of Malaysia Airlines flight MH370, the transport minister said on Friday. In May, Malaysia called off a privately-funded underwater search for the aircraft, which became one of the world’s greatest aviation mysteries when it vanished with 239 aboard en route to Beijing from Kuala Lumpur on March 8, 2014. The investigation team would brief families of those aboard on the report at the transport ministry on July 30, said the minister, Anthony Loke. “Every word recorded by the investigation team will be tabled in this report,” he told reporters, adding that a news conference would follow the closed-door briefing. THE only way MH370 would have been able to deviate from its flight path was if it was under deliberate, manual control. But there’s still more questions than answers after the report was handed down. THE Malaysian Government has released its final report into the disappearance of Malaysia Airlines Flight 370. It says all the evidence points to an incontrovertible conclusion — that it was under manual control, and that it was deliberately flown out into the Indian Ocean. The Malaysian government’s chief investigator into the disappearance of the Boeing 777 has been addressing a press conference in Kuala Lumpur today. Flight MH370, carrying 239 people, including six Australians, disappeared on its way from Kuala Lumpur to Beijing on March 8, 2014. It is one of the world’s greatest aviation mysteries. “The autopilot has to be disengaged,” Chief Investigator Kok Soo Chon described the first turn tracked by civilian and military radar after the flight deviated from its course. However, it could not be established that the next two turns over the south of Penang and the north of MEKAR were under manual control or autopilot, he added. The rest, he said, remained a mystery. “This is not the final report,” Chief Investigator Kok said. A link to the 495-page report is in the article. No Plane. No Remains. And Now, No Real Answers on Malaysia Airlines Flight 370. HONG KONG — One of the greatest aviation mysteries of all time deepened on Monday when the official government inquiry into the disappearance of Malaysia Airlines Flight 370 released a 495-page report that gave no definitive answers as to the fate of the airliner. KUALA LUMPUR, Malaysia — Malaysia's civil aviation chief said Tuesday he has resigned to take responsibility after an independent investigative report highlighted shortcomings in the air traffic control center during Malaysia Airlines Flight 370's disappearance four years ago. Page created in 6.21 seconds with 20 queries.